The Census published one-year long survey estimates for 2014. Chicago’s bike commute mode share is up slightly from 2012, and up significantly from 2013. However, the Active Transportation Alliance doesn’t believe 2013 dip is accurate. Last week, the United States Census Bureau released new American Community Survey one-year estimate data, including estimates on the percentage of workers who who commute by bicycle. 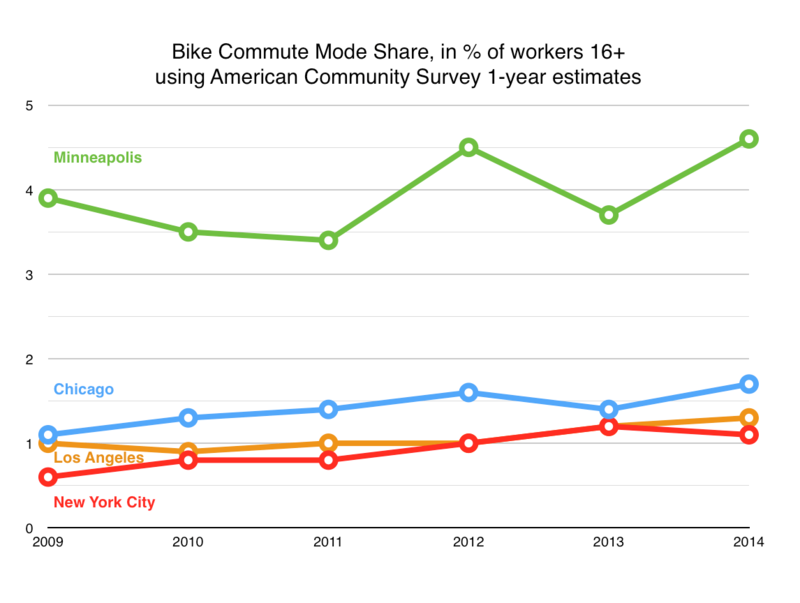 Chicago’s bike mode share, as measured in 2014, seems to be on the rise compared to 2012 and 2013. However, there are several major caveats about the data. Survey participants are only asked to identify what their more distant mode of getting to work was in the past week. For example, if you ride your bike a mile to an ‘L’ stop and then take the train two miles downtown, that’s only counted as a transit commute. The Census conducts the surveys in the spring, when many Chicagoans may still be using their winter travel modes and have not taken bikes out of storage yet. And the estimates have a margin of error of 0.2 percentage points, so it’s possible that a year that’s reported to have had a decrease in biking could actually have seen the mode share stay the same, or it may have even increased slightly. According to the new ACS data, about 1.7 percent of Chicagoans 16 and older rode a bike to work in 2014 – the highest figure the Census has ever reported for our city. That’s up from the 1.4-percent mode share reported in 2013, and a slight increase from the 1.6 percent figure in 2012. However, the 0.2-percent margin of error means it’s possible the real mode share was as low as 1.5 percent, or as high as 1.9. Therefore we should take the reported 1.7 percent figure with a grain of salt. The Census will release the ACS three-year and five-year estimates later this year. These are based on surveys of more people, over a longer period of time, so they’ll provide more reliable figures on Chicago’s bike mode share. It would be very helpful if we had more detailed data about where and when Chicagoans ride bikes, instead of just an estimate of how many people are using a bicycle as their primary mode for getting to their jobs. After all, people use bikes for all kinds of trips that aren’t work commutes. If we had more accurate info about non-work commutes, that would help prove that a much higher percentage of residents are using bikes to get around than the modest Census figures indicate. For example, if Wicker Park merchants had data that showed a high percentage of their customers arrive by bike, that could build support for reconfiguring Milwaukee Avenue to make it safer for cyclists. The Chicago Department of Transportation’s bike counts are an additional source for understanding changes in bicycle ridership, but they have their own limitations. Staffers and volunteers count bicyclists manually at 20 downtown locations on one day each quarter, during the morning and evening rush hours. According to the CDOT counts, the total number of cyclists at these 20 locations increased in the morning rush hour 19.5 percent from 2012 to 2013, and 14.3 percent between 2013 and 2014. The afternoon bicycle counts increased 26.2 percent from 2012 to 2013, and 15.2 percent between 2013 and 2014. In addition to the quarterly downtown counts, CDOT counts bicyclists at six neighborhood locations monthly. Spokesman Mike Claffey said they are working to create a database of all bike counts. Currently the counts are buried in individual PDFs. However, volunteers from the civic technology group Chi Hack Night (which I help run) recently transcribed the counts as part of a project to map Chicago bike equity, a collaboration with Slow Roll Chicago. Is Chicago’s Bike Mode Share Really Stagnating? Here's why we should take the latest Census report with a grain of salt. 5 Things You Should Know About the State of Walking and Biking in the U.S. The handful of cities that led the rebound of U.S. bike commuting a decade ago seem to have slowed down — but growth elsewhere suggests that progress can still happen.